guitarnerd.com.au » Maton Wedgtail – part 2. Running the nerd behemoth that is Guitarnerd INC PTY LTD YMCA LOL YOLO isn’t as easy as it seems. For one… I have a strict policy that I don’t take stories from other blogs and repost them on my site. I want my content to be as unique as possible, which I feel is why guitarnerd has been as successful as it has. This means a lot of work for me, as I actually have to go out there into the wide world and track down stories that I think will fit with my site. With my workload, sometimes I don’t have the time (or energy) to track down stories as regularly as I’d like, and I apologise for that. I used to get a majority of my stories from bands that my band played gigs with. These tools of the trade were the reason I started guitarnerd in the first place… so I could document these amazing instruments. But ALL of my bands are currently on hiatus for one reason or another and I’d rather each and every article be interesting and unique than just post ‘hey… Fender has a new Squier Bass VI”. That’s what y’all want, isn’t it? One of the greatest things that has come out of starting this site is meeting the guitarnerd community. Through this site I have met some AMAZING people… like minded guitarnerds in body & soul. Ian R with his amazing Flamingbyrd’s, Ken P & Greg T with their fantastic Maton collections… people I would never have gotten to know if not for this site. I also receive lots of emails from people asking for advice. I’ve never admitted to being an absolute expert on all things guitar, but I try to help out whenever I can and I really appreciate all the emails and comments I receive. Thank you so much for taking the time to read and write in. I also get a LOT of emails from people asking me if I want to buy their guitars. I guess everyone thinks I’m mega-rich, but my guitar collection has been built up by careful trading and selling of other pieces. A guitar of mine you may have read about might already have been traded to get something even sweeter. Of course there are some I’ll never sell, and as my collection gets refined more and more to the coolest pieces, the list of gear that I want to trade is getting less and less, and soon I’m going to have to stop. One such offer I received a few weeks ago I absolutely couldn’t refuse. In the last guitarnerd story, Michael S showed us his cool as hell cream white Maton Wedgtail. My absolute holy grail Maton… the mythical bird that is so rare that I’ve only actually ever touched ONE. (Thanks Tex for bringing yours to the Tote Hick show to show me!) Well, Michael had bought some new gear and offered me the Wedgtail for a very reasonable price. I couldn’t say no… this would probably be the ONLY opportunity I’d ever get to buy a Wedgtail. I quickly looked at my music gear list of stuff to sell and my Mesa Boogie Mark 1 fit the bill. The price was around the same as the Wedgtail and I didn’t really use it anymore. It sold surprisingly quickly (thank you Lindsay!) and a week later, a very guitar shaped box arrived at my door step. Now, after playing, trading and owning so many cool guitars… I must admit I’ve become a little jaded. I could look through the whole of ebay from start to finish and not even raise an eyebrow. There aren’t many guitars out there anymore that really get me excited. But a Maton Wedgtail? My hands were actually shaking a little as I cut open the box. I opened up the hard case and there she was. A guitar I’ve wanted so bad that I’d actually given up on the idea of actually owning one as the thought hurt too much. And yes, it was all I’d hoped it to be. Michael had explained a fair bit of the details in his story so I won’t repeat it all. I’ll try explaining my thoughts of this most mighty of axes. First, it just looks fantastic. The colour is a great cream white… which matches my sharkbite Fyrbyrd perfectly. I was originally more of a fan of the series 1 Wedgtail with the bigger horns and slotted headstock, but the series 2 has pipped it. I love the more compact shape and the 70′s style Strat headstock. 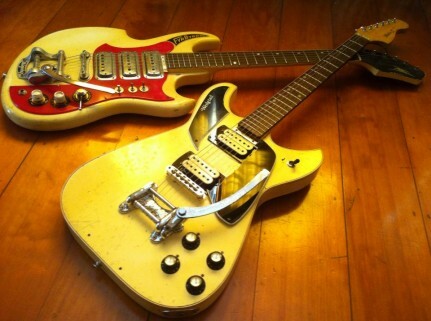 Plus the cream pickups look like they were made for the guitar. I know they’re not original, but man they look good. The neck… wow. Maton really knew how to carve a neck back then. This is like the best Strat neck… really similar to my Coronado Strat. The fretboard radius is pretty flat (as it seems to be on most of my Matons) and the back of the neck is wonderfully worn. This guitar has been played HARD. The tuners though are rubbish. I’d change them but they’re original. Same as the tremolo. It’s actually an Italian Eko unit and is absolutely sh!t house. The arm is fixed so you can’t swing it out of the way and the chrome looks like its got a skin disease. I don’t know why Maton stopped using Bigsby’s (actually, I have an idea…$$$) but this ‘thing’ doesn’t deserve to be on this guitar. But again… it’s the original unit so it stays. At the moment I just love looking at this guitar. With a 5 month old baby, I can’t make too much noise around the house so it’s just a few quiet strums on the couch. But next band practise… Man I’m going to give this thing a caning. Tony. Much respect ..enjoy your new prize…you deserve it. There is a spot in the middle switch position ( accessing two sets of tone and volume pots) that has tone like no other. Keep finding the good stuff. Congrats Tony, sorry I havnt been in touch. Happy you have your unicorn guitar. You were first on my list if I was to sell mine. I’ll have to change the list now. So mine may not have left with a bigsby? Maton did tell me one thing is certain, they couldn’t be certain as they were almost custom made after the first lot. Love your Wedgtail. I have an almost mint one in Red Sunburst with a Bigsby trem. I used to have other Matons but costs of bringing up a family has reduced my Matons to the Wedgtail, a Flamingo and a DC545. In 1998 I took photos of all for a proposed History of Maton Guitars publication. I’m still waiting for a copy!